BOSTON — Who would have thought it? The quest for eternal life, or at least prolonged youthfulness, has now migrated from the outer fringes of alternative medicine to the halls of Harvard Medical School. 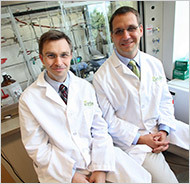 AGE WELL David Sinclair, left, and Christoph Westphal, co-founders of Sitris Pharmaceuticals, in Dr. Sinclair’s laboratory in Cambrdge, Mass. The company develops drugs that mimic resveratrol, a chemical found in some red wines. At a conference on aging held here last week, the medical school’s dean, Jeffrey Flier, was to be seen greeting participants who ranged from members of the 120 club (they intend to live at least that long) to devotees of very low calorie diets. The heavyweight at the conference was Sirtris Pharmaceuticals. The company is developing drugs that mimic resveratrol, a chemical found in some red wines. Resveratrol has been found to activate proteins called sirtuins, from which the company derives its name. Activation of sirtuins is thought to help the body ride out famines. Mice and rats put on a diet with 30 percent fewer calories can live up to 40 percent longer. They seem to do so by avoiding the usual degenerative diseases of aging and so gain not just longer life but more time in good health. Sirtris’s researchers think that drugs that activate sirtuins mimic this process, strengthening the body’s resistance to the diseases of aging. The company has developed thousands of small chemical compounds that are far more potent than resveratrol and so can be given in smaller doses. Any sirtuin activator that averted all these diseases in people would be a rather remarkable drug. So there is considerable interest in how well Sirtris’s drug trials are going. Sirtris’s senior director of corporate development, Brian Gallagher, said at the conference that four active clinical trials were under way. Dr. Gallagher said that unpublished tests in mice showed that another chemical mimic, SRT-1720, increased both health and lifespan; after two years, twice as many mice taking the drug were alive compared with the undosed animals. Resveratrol itself has not been shown to increase lifespan in normal mice, although it does so in obese mice, laboratory roundworms and flies. Sirtris has so far been doubly fortunate. No severe side effects have yet emerged from the clinical trials. The company has also been lucky in having apparently picked the right horse, or at least a good one, in a fast-developing field. Besides the sirtuins, several other proteins are now known to influence longevity, energy use and the response to caloric restriction. These include the receptors for insulin and for another hormone called IGF-1, and a protein of increasing interest called TOR (“target of rapamycin”). Rapamycin is an antimicrobial that was recently found to extend lifespan significantly, even when given to mice at an advanced age. Since TOR is involved in the response to caloric restriction, rapamycin may extend life through this pathway. Many theories of aging attribute senescence to the inexorable buildup of mutations in a person’s DNA. Dr. Sinclair said that in his view “aging can be reversed” because the DNA mutations did not directly cause aging. Rather, they induce the sirtuin molecules that help control the genome to divert to the site of damage. With the sirtuins absent from their usual post, genes are not regulated efficiently, and the cells’ performance degrades. Diversion of the sirtuins should be a reversible process, in Dr. Sinclair’s view, unlike DNA damage, which is not. Some attendees were so convinced of the virtues of less food that they have begun severe diets of various kinds. Cynthia Kenyon, of the University of California, San Francisco, said she had gone on a low-carb diet in 2002 after finding that food with even 2 percent sugar reduced the lifespan of the laboratory roundworms she studies. “Basically I try to steer clear of desserts and starches, though I do eat chocolate,” she said. Her willowy figure makes her look at least a decade younger than her age. But a practitioner of more severe caloric restriction who was at the conference looked gaunt and a little frail. Sirtris’s quest for longevity drugs is founded on solid and promising research. But most drugs fail at some stage during trials. So there is no guarantee that any of Sirtris’s candidate compounds will work in people. The first result from a Phase 2 clinical trial is not expected until the end of next year at the earliest. Meanwhile, it is a pleasant and not wholly unfounded thought that, just possibly, a single drug might combat every degenerative disease of Western civilization.